Treasure Island nightlife has something for everyone. Whether you are looking for dancing at Captain Kosmakos, the high-energy fun of Gators Cafe, or just a quiet evening, Treasure Island FL has it all. Want pulsating music where the dance floor vibrates off its foundation? Looking for a place to dance to more contemporary, Top 40 or Oldies tunes? Or are you seeking some soft music for a relaxing and romantic evening with someone special? The nightlife on Treasure Island has something for everyone. Treasure Island nightlife is some of the best you will find on a small sandbar. There is live music at many of the little beach bars on the weekends, but some of the bigger places have music and dancing every night. If you want to live the Florida beach life, put one of these places on your social calendar for the weekend. People mistakenly dismiss Gators as a hangout for the younger set. I won't lie to you, the main clientele is the 24-40 age group, but there is a huge contingent of retirees and older locals who are regulars. This place is "Party Central"...with a capital P. If it's happening on Treasure Island FL, it is happening at Gators Cafe and Saloon. Located on the east side of Gulf Blvd, immediately after you cross John's Pass Bridge heading south into Treasure Island from Madeira Beach, there is so much going on at this place you wonder why they don't charge for guided tours. 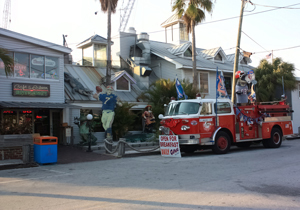 Gators Cafe and Saloon is the motherlode of waterfront bar activities. Live bands play Thursday - Sunday with DJ's the other nights, there are great Elvis impersonators, good food, cold beer, a $1000 Bikini Contest every Sunday afternoon, and Beer Pong on Tuesdays. You can watch all of your favorite sports on 30+ big screen TV's. There are great drink specials all the time. Gators Cafe is a unique experience. There are clean restrooms, great service, and things don't get out of hand. All Univeristy of Florida football games are like an out-of-body experience. There is plenty of parking along Kingfish Drive or in the two big parking lots. If that is not enough, breakfast is served from 7:00 AM - 11:00 AM and there are a huge amount of free boat slips if you come by water. The Treasure Island nightlife scene is not complete without a stop at Gators. It boasts of having the longest waterfront bar in the world. The back deck is a great place to watch boats come and go through John's Pass, checkout all of the activity across in Johns' Pass Village, or just watch dolphins swim by at sunset. For those who want a taste of Treasure Island nightlife without a lot of hoopla, Captain K's is the place. This is where the 45-and-over crowd comes to dance on Fridays and Saturdays. It gets packed...with a capital P.
Women wear everything from nice black evening dresses to sundresses on the dance floor. Men are dressed in business casual with nice golf shirts or colorful Aloha shirts. In the winter, you'll see lots of sports coats. 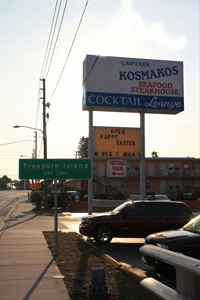 Sloppiness is not a part of the Treasure Island nightlife in Captain Kosmakos. Beer, mixed drinks, and sodas are all reasonably priced. Plus, I've never been turned down for a dance here. Come early if you want a good seat close to the dance floor. Negotiating your way through the aisles can get pretty tricky after the band starts playing. There are lots of regulars here. Since the music is good and the dancing is continuous, those under 40 who would rather dance than drink show up, too. Don't spend a lonely evening on the weekend. Come out and dance.